Mark Bovit keeps Chicago cops in uniform. 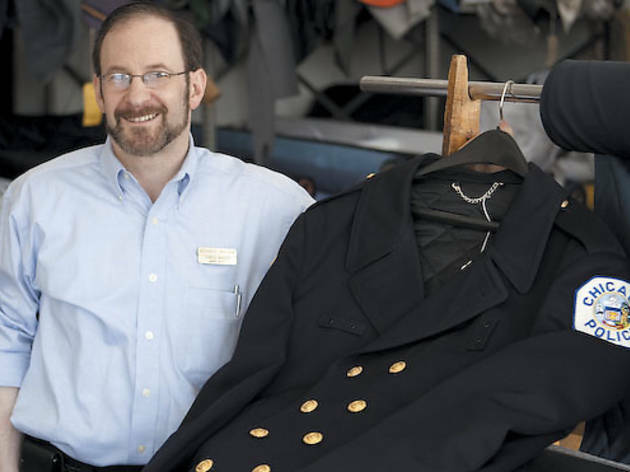 The other day, Mark Bovit was hunched over a table at his South Loop shop, Advance Uniform, sticking straight pins into a bulletproof vest cover. A Chicago Police officer brought the body armor in and tapped Bovit to make a black, tactical shell he could wear outside his shirt. Advance Uniform (1132 S Wabash Ave, 312-922-1797)—also a vendor of official outfits and accessories (badges, patches, handcuffs) for Cook County Police, EMTs and private security companies—isn’t the only police-uniform supplier in the city. There are competitors—J.G. Uniforms on the Northwest Side, AJ Uniform on the Southwest Side, for instance—but Advance has been at it the longest. Bovit’s late father, Isaac, a Polish tailor who immigrated to the U.S. after surviving a Holocaust concentration camp, started the business in 1955. “His expertise back in the old country was clothing,” Bovit says. 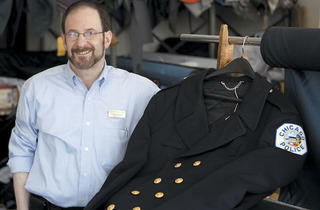 “So he saved up a little money and started making products for police officers.” He made his name making custom officer dress coats for new recruits. As a kid, on weekends, Bovit would tag along with Dad to the South Loop storefront, which has the same wood paneling on the walls today as it did when it was built in 1971. “In summers, I’d pack boxes. The cops thought I was a hoot—you know, a cute kid hanging around.” Bovit learned the craft from his father and was eventually invited to take over the family business.